Welcome to the Rauen family estate. Discover the many aspects and delights of the world of wine. The Rauen family estate has a long tradition. We have been earning our living from wine growing for generations. In the 1980s Harald Rauen started to study wine growing and together with his parents tended the estate under the name of "Weingut Eduard Rauen und Sohn". In 1983 the family made a policy decision of importance: until then the wine was only sold in bulk to a small number of customers, but now the accent was on selling the bottled product. Since then our products have found their way into countless wine shops in Germany, with exports to the USA, the UK, Sweden and Belgium. 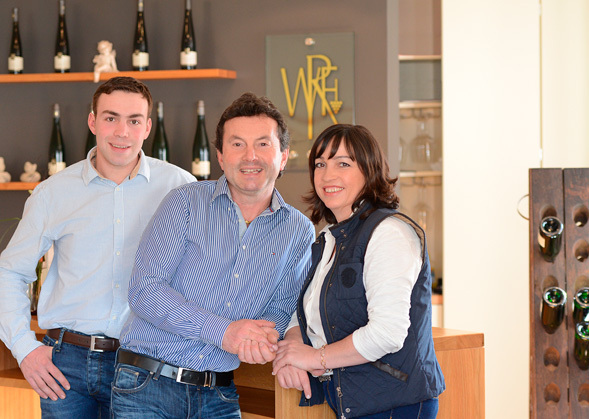 Since 1990 Harald and Maria Rauen have been running the estate under the name "Weingut Familie Rauen". Owing to increasing demand the facilities in Detzem soon became too small. Since moving in 1997 to nearby Thörnich we have vastly increased our capacity.